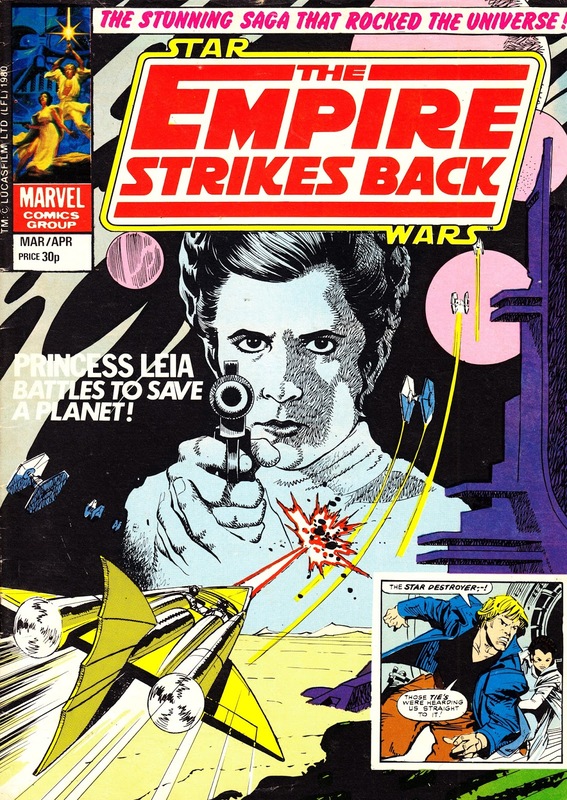 From 1981: STAR WARS: THE EMPIRE STRIKES BACK MONTHLY issue 144, reprinting Starfire Rising from issue 54 of the US run. This issue boasts another unique-to-the-UK cover. Curiously it also omits the issue number and hedges its bets over the month of publication, suggesting that the British Bullpen were having some production and scheduling issues around this time. The main story is, as with the last issue, an old John Carter inventory story left on the shelf when Marvel lost the license and closed the title. Marvel tried to stockpile stand-by strips that could be slotted in at any time if a title looked like it would drop behind schedule... but these were often left unpublished when a title closed. This wasn't a problem when Marvel owned the character as the one-shot story would eventually see print in one of the 'spotlight' anthologies or - in the 1980s - in the pages of MARVEL FANFARE. But licensed books were more of a challenge. And Marvel's accountants demanded that everything paid for had to appear somewhere. So the unpublished strip was rather crudely reworked into a STAR WARS two-parter. And it stood out a mile. I suspect sales, on both sides of the Atlantic, took a hit when casual browsers spotted that the main strip barely looked like a dispatch from the galaxy far, far away. I've not yet come across that guardians of the galaxy mag you mentioned last week but I did get the usa comic with the same death's head story. also out today - a RIVERDALE DIGEST in a handy pocket size edition. and an updated version of THE A - Z OF SUPERHEROES with material on the new GOTG movie. Technically. this is SFX bookazine 16. - The new X-MEN '92 trade which includes the original Death's Head as part of the cast. I've not read it yet so I can't vouch for how good it is. - The Topps STAR WARS WIDESCREEN CARDS book. - The new issue of the TRANSFORMERS GENERATION 1 partwork, reprinting the (unfortunately named for so many reasons) 'Headmasters' mini-series and follow-up strips from the US and UK titles. A couple of nice behind-the-scenes articles as well. - The new DOCTOR WHO MAGAZINE SPECIAL EDITION devoted to toys and games. It's another really nice package... including a VERY interesting interview with the chap who ran Dapol Toys. - It's been out a week but the first spin-off special in the STAR TREK COMICS part-work reprints the Trek/ Green Lantern crossover. The next - unscheduled - special will reprint the POTA crossover. - The new magazine INFINITY, from the Darkside folk, is apparently out although I have not seen it in any shops yet. It will be interesting to see the extent of distribution. and a further addition : the new marvel fact file has a few pages on captain Britain. I saw that x-men trade but didn't realise DH was in it. I'm really enjoying the current run of trek / green lantern as it depicts not just Khan but his followers also. A scenario absent from STAR TREK INTO DARKNESS.